Happy Monday to everyone. I hope you had a great weekend. It went by waaaay too fast. My boys were not happy about having to go back to school today. Christmas break went way too fast. Before we talk about these cookies, I have a cooking story to share with you. On Friday we decided to have a Disney movie marathon. I got a bunch of treats out and decided to make a batch of our favorite gooey Chex mix for us to munch on. I got the cereals, almonds and coconut poured in a bowl and made the gooey mixture. Things were looking great and then I poured the hot gooey stuff over the cereal mixture. As I stirred it I could smell this funny smell. It just kept getting stronger and stronger. The best way I can describe it was a rancid soapy smell. I know, weird. I took a small bite of the stuff and it seemed fine. I stirred a little more and then took another bite and yikes, it was nasty!! I thought maybe the bowl or spoon I was stirring with had some soap on it that didn’t get rinsed off completely. The gooey mixture on its own tasted fine and the cereals and almonds tasted fine. Thankfully I’d only made a half batch because I sadly threw it out, washed and rinsed everything really good and started over. As I was measuring out the coconut I noticed some of the coconut in the bag was kind of yellow. I took a big whiff of it and there it was, the smell, the rancid soapy smell. . . my coconut was bad. Have you ever had that happen? I never have, plus it was a newer bag of coconut that was supposed to be good through May 2015. Stupid coconut! Anyway, I made a new batch with good coconut, obviously, we all ate way to much off it and then lived happily ever after. 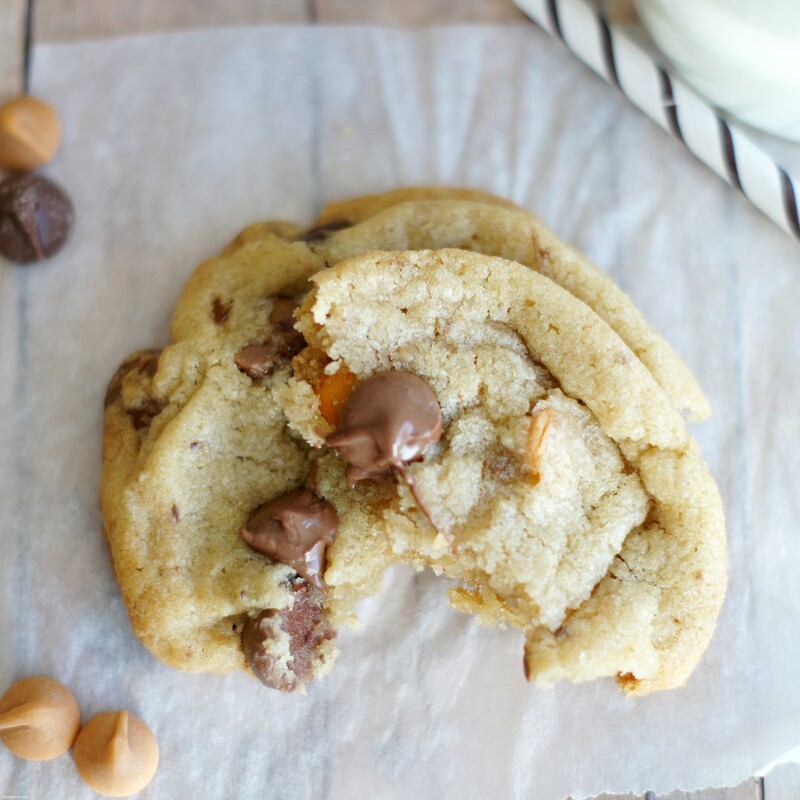 Ok, let’s talk about these chocolate chip toffee butterscotch cookies. They came about because I had opened bags of chocolate chips, butterscotch chips and Heath toffee bits that I really wanted to use up. So I did. 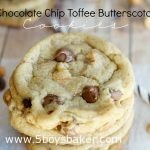 The combination of those three make a really fabulous cookie. . .buttery, crispy and chewy and really, really good. 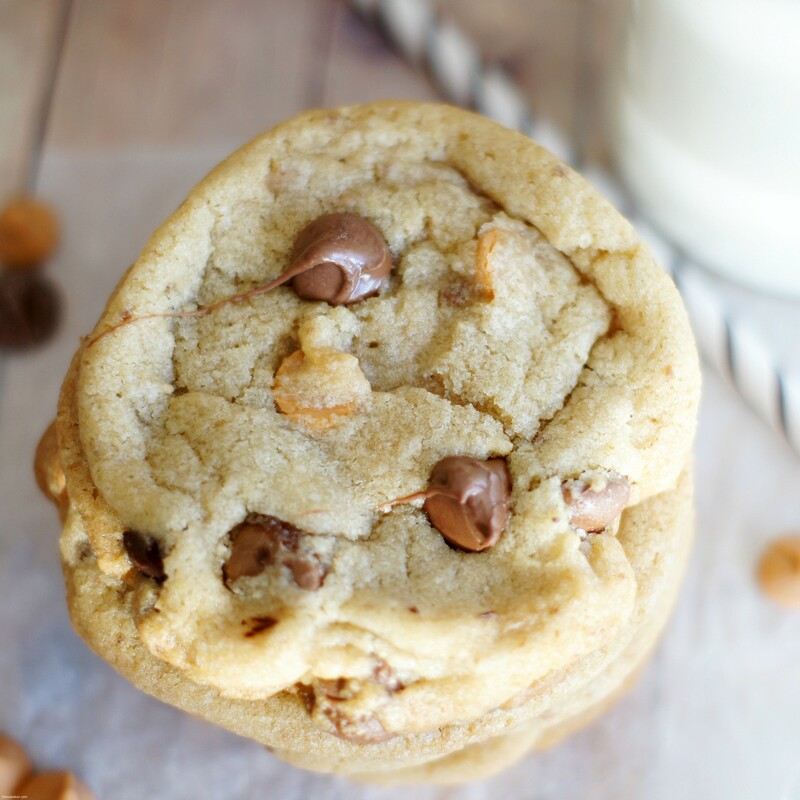 Crispy, chewy and buttery, and filled with chocolate chips, butterscotch chips and toffee, these cookies are hard to resist. Preheat oven to 350 degrees F. Line a large baking sheet with a Silpat baking mat or parchment paper. Set aside. Add flour, baking soda and salt. Mix until just combined. Stir in the chocolate chips, butterscotch chips, and Heath Toffee Bits. Using a cookie scoop, drop dough onto prepared baking sheet. Bake for 12 minutes or until the edges are slightly golden brown. Remove from oven and allow the cookies to cool on the baking sheet for 2-3 minutes. Transfer cookies to a wire cooling rack and cool completely. Hey Jodi, did you know grandma kept her coconut in the freezer? Keeps for a LONG time! I forgot she did that. Crazy thing is I’ve had coconut turn dry and stale on me but never had it go yellowish and rancid. Just wondered how many cookies this makes? Was wondering what size cookie scoop you used so I know how big to make the cookies. Thanks you. These look delicious! Hi Janet, I use a small cookie scoop (it’s about 2 tablespoons). I do fill the cookie scoop really full and get about 4 dozen cookies. You could really make them any size you want, just adjust the cooking time.